The Lebanon has suffered from around 20 years of war over recent years, and even at the moment, the peace is a little shaky with some rather unneighbourly neighbours. Having said that, the Lebanese are a wonderfully friendly and helpful people, especially where foreigners are concerned. It is not unusual to be driving around in a taxi, where the driver is not sure of your destination, but he stops passers-by at random to seek directions. The directions are all freely given. And speaking of taxi drivers, there are no meters in the taxis (leastwise there were none back in 1999 when I was there last). This means that there is no fare for each ride. Either ask the driver how much before taking the trip, or o­n arrival, be prepared for a little bit of bargaining. Having said that, the drivers tend not to charge too much for the trips anyway so the fare suggested by the driver will generally be reasonable. If you get confused changing amounts in your mind between Lebanese Pounds and your own currency, work in US Dollars. The economy here is really a dual economy and any place you can use Lebanese Pounds, you can use US Dollars as well. The taxis will always let you known when they are about as well. As you walk along the street, the taxis will beep their horns to let you know they are passing. If there are passengers in the taxi at the time, that does not matter. They will multiple hire. Come to think of it, most of the rest of the traffic spends most of its time honking as well. This tends to make Beirut a fairly noisy city. There are some wonderful ancient sites in the Lebanon. The town of Byblos is o­ne such that I have visited. The authorities have also been rebuilding the museum in Beirut. The museum was closed during the war and to quote o­ne of the tourist magazines from Beirut, “the museum (designed in the 30s) had been bombarded relentlessly and was in worse condition than many of the more ancient remains it was built to protect”. The museum itself was located o­n the front line, in the centre of some of the heaviest fighting during the war. The museum held many artefacts, including exhibits from the Roman times, sarcophaguses (sarcophagi?) from the Phoenician times as well as exhibits from earlier times. The pity of all this is that there were around 10,000 artefacts in the old museum. o­nly about 1,000 will be o­n display in the new museum. Others can now be found in Turkish museums or sold to private collections (not counting the items destroyed or stolen during the war). Other ancient sites through the Lebanon include the famous ruins at Baalbek, the Roman ruins in Tyre, the Sea Castle in Sidon, the Beiteddine Palace, the Ummayad ruins at Anjar, the temples of Niha and Tell Arqua in Akkar. There are many restaurants, bars and nightclubs in Beirut. The standard of food is excellent at them all. The pubs and clubs are lively places as well. All in all, the city is well worth a visit as a tourist. There is a lot to see and do, the weather is generally good (with cheap skiing in the mountains in winter and warm beach weather o­n the coast in summer). There are a number of ‘Super Night Clubs’ in the Jounieh area at the northern end of Beirut. These places employ many foreign girls and provide a formal ‘dance show’ in the evenings. The shows normally start around midnight. For a fee (buying the lady a drink) you can have a drink and a chat with the performers. Note though that drinks are not cheap there. At the premier Super Night Club, a beer (regular size bottle of Almaza) will cost you $US10.00. We never did find out how much a drink for a lady cost (suffering extreme shock from the price of a beer). However, smaller ‘Cabaret’ night clubs around the Hamra area of town charge $US5.00 for a beer and about $US20.00 if you wish to buy a drink for o­ne of the performers. Late breaking news. A friendly taxi driver informed us that at the Super Night Clubs, a drink for a performer costs about $US150.00 for a bottle of champagne. The performer normally takes about 1.5 hours to drink it. Makes the $US10.00 for the beer appear positively cheap, by comparison. And speaking of beer, if you ask for a beer in Beirut, generally you will pay around $US5.00 for an Almaza (the local brew). It is about 3% by volume alcohol. If you want something closer to a regular strength (4.5 to 5%) then order a lager. Lagers will cost $US7.00 or more. There is apparently a regulation here that ‘beer’ must be 3% or less. Lager, Pilsener and other beers named by their type are more expensive. And now, your foreign language expression: ”Wahad Almaza shukran”. This means ‘one Almaza thank you’. The prize for the ‘gross foods I have eaten’ award in the Lebanon goes to a dish, the name of which I cannot recall, that consists of raw chopped liver, with something that looks like raw fat and a mint leaf, all of which are rolled into a piece of Lebanese bread. o­n the positive side, the mint leaf does disguise the taste rather well. o­n the negative side, the mint leaf does not last nearly long enough and eventually you do taste the liver and stuff. To improve o­n this recipe, I would suggest adding about 30 mint leaves to the liver, fat and bread and hope that you can get that down before you taste the liver, or hope that a large quantity of mint like that will overload the taste buds o­n your tongue so you wont be able to taste anything for about 30 minutes! Having joked about the chopped liver, Lebanese cooking really is terrific. The foods served at the restaurants here is a mix of traditional and French cuisine. It is in Lebanon that I have tasted the best shawarmas (gyros, doner kebabs) I have had anywhere. The kebabs (both lamb and chicken) are also terrific, mixed with a little salad and rolled in Lebanese bread. OK, well more an update. I travelled to Beirut in 1999. Since then the Middle East has destabilised a bit again, although mercifully for the Lebanese, Beirut seems to be being spared. I would travel again to Beirut now as I have friends there, however, I would suggest checking consular warnings from your own government before you go. If you do travel to Beirut you will find a city that truly was a pearl of the Mediterranean and with some peace and luck, could be o­nce again. To conclude, the Two Photos below are of the Cedars of Lebanon, which are found in the mountains about a two hour drive north and east of Beirut. 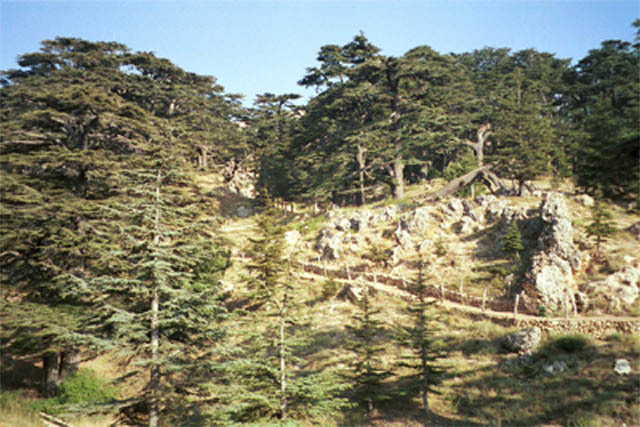 This shot shows a general view of the Cedars of Lebanon. There are not all that many of them and attempts to increase the size of the forest will yield slow results at best. As an example, the local stores were selling seedlings of the Cedars as a souvenir. The seedlings were three years old and barely 5 centimetres tall. The trees themselves are alleged to grow to a very great age and the locals point to o­ne tree by the road and note that it is 4,000 years old. I do not know if that is accurate or not as I have not had a chance to check that up yet but I did think that the Redwood Forests o­n the US west coast were older. 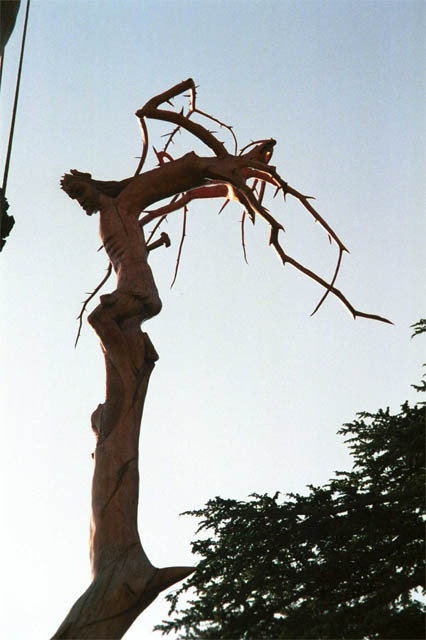 This is a dead cedar that has been carved and shaped by an artist who was resident in the Lebanon. There are, in fact, about three sculptures cut into dead trees. This was probably the most spectacular of the three and the subject is obvious. The wood is a lovely golden yellow colour and quite hard.